Okay. This is a big story. There are sort of two big stories in this wedding. Are you ready for it? Chantelle and Isaiah have been together for over 8 years and they are seriously JUST THE CUTEST. When I first met with them about a year ago to talk about their wedding, I knew it was going to be special just because of how plainly in love with each other they are. Chantelle is the sort of careful planner and sweet personality that make working with her a joy and I was looking forward to sharing the day with them for quite a while. The couple’s wedding was a throng of happy family and friends at the First Assembly of God Church in Burlington with their party following at Barn on the Ridge in Burlington, Iowa. Chantelle's style was chic and sophisticated and the moody and industrial settings of their portraits reflect the understated glamour their day oozed. Highlights of the day included an emotional, tear filled ceremony and speeches, lots of lovely bridal portraits and Chantelle upping the bride bar pretty high by being not only willing to climb a ladder onto a roof in her wedding dress for photos but being absolutely excited about it. My kind of bride right there. Early on in the day, the groomsmen had started singing a cappella and beat boxing--just jamming really! Later on when I was with the entire bridal party, I was struggling to creatively pose them all when it suddenly struck me to ask them to dance down the street towards me while singing and dancing as I had seen the guys do earlier. I thought this suggestion might strike them as weird but everyone instantly grasped what I wanted to do and these exuberant dancing images are among my favorite that I’ve ever taken at any wedding. Getting them to calm down and actually stop singing and dancing to “My Girl” and “ABC” was a laughing struggle and it set the tone beautifully to enter their reception with a bang. Alright. Are you ready for part two of the story? It’s awesome. When I was hired to shoot Chantelle and Isaiah’s wedding, little did I know that the best man and brother of the groom, Elijah had a ring in his pocket and was just waiting for the perfect opportunity to ask his long-time love Alicia (who was a bridesmaid and a best friend of the bride), for her hand. The pair had been together just as long as Isaiah and Chantelle and the 4 were a tight, loving gang. Throughout the day, Chantelle, who was totally aware of the surprise coming kept giving Alicia a hard time, saying things like "Where's your ring? When is Elijah ever gonna make an honest woman out of you? ", which led to funny portraits and lots of laughs. It was obvious that Alicia was so used to these jokes and enjoyed them even though she earnestly wanted Elijah to ASK already. I only knew of the coming surprise for a couple hours before it happened but in that time I was careful to photograph little moments between Alicia and Isaiah, knowing one day they would not just look back on this day as precious because their best friends tied the knot but because it was the day they would commit to each other for real. Alicia was completely clueless to what Elijah and the rest of the wedding party had planned for the reception. During the bouquet toss, Chantelle gave her bouquet pointedly to Alicia, which made the whole reception laugh. Afterwards, came the garter toss. 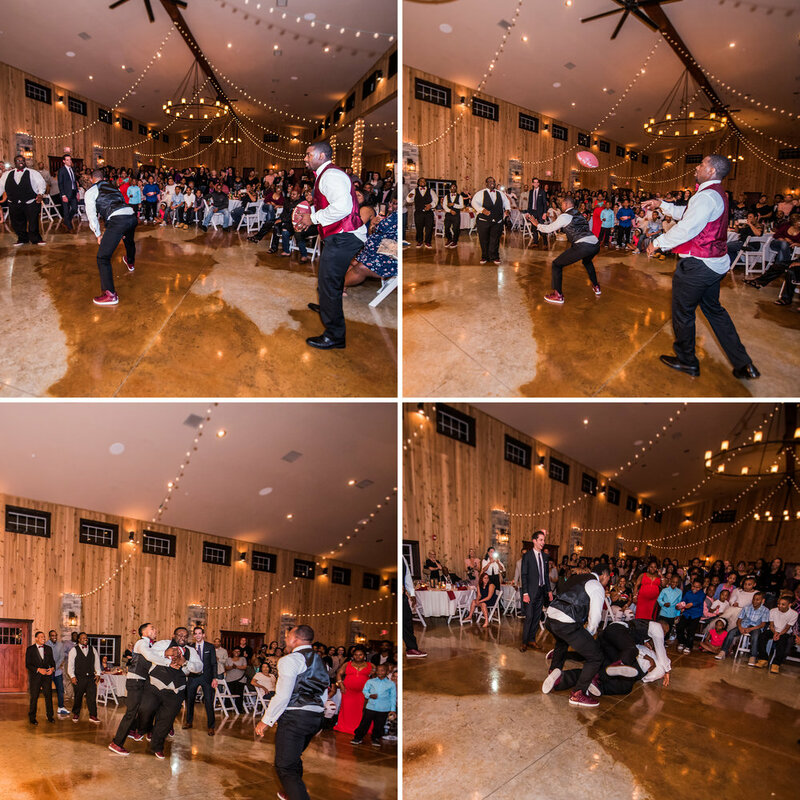 The groom made a great show of getting the garter off his bride but in the end came up with a football instead and began a scrimmage with his boys. He tossed it to his brother Elijah, as was the plan all along, and Elijah was instantly tackled heavily to the ground by all of the groomsmen. Elijah then faked an injury and remained on the ground for far too long. The reception which had been laughing, grew silent. Alicia rushed over, "Are you okay, baby? What happened?" The whole bridal party hovered around to make it seem as though something had really happened as Elijah struggled to his knees. The ring box was smuggled to him as he was catching his breath with Alicia and to his brother's voice MC'ing the whole thing, Elijah turned to the flabbergasted Alicia and proposed. She lost it. 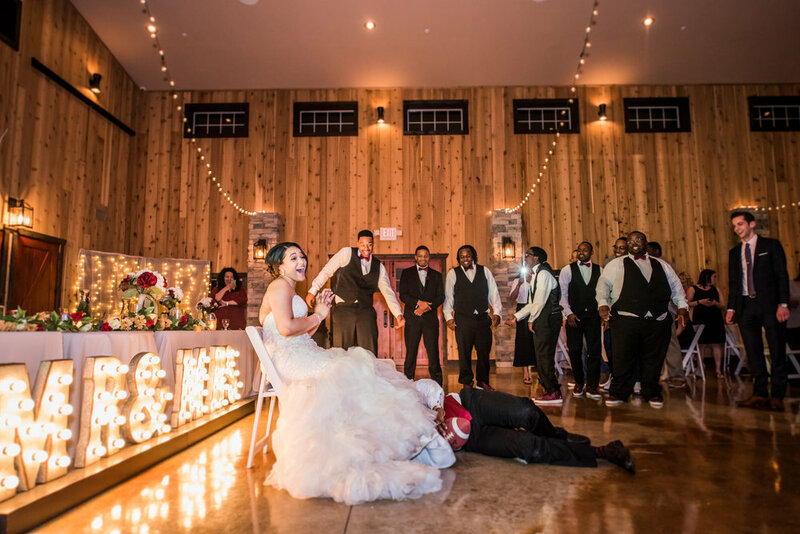 She was so surprised and when she finally did say YES, the whole room exploded and the party that followed it was like nothing I've ever witnessed in my wedding photographer career. The happiness was contagious. It wasn’t just about Elijah and Alicia, it wasn’t just about Chantelle and Isaiah it was a whole room simply celebrating love in a loud, crazy, groovy kind of way. And it was awesome. Enough talk. You should really check out this awesome wedding. Congratulations to Mr. and Mrs. Stout!